She came home and said “woa i se-ow. 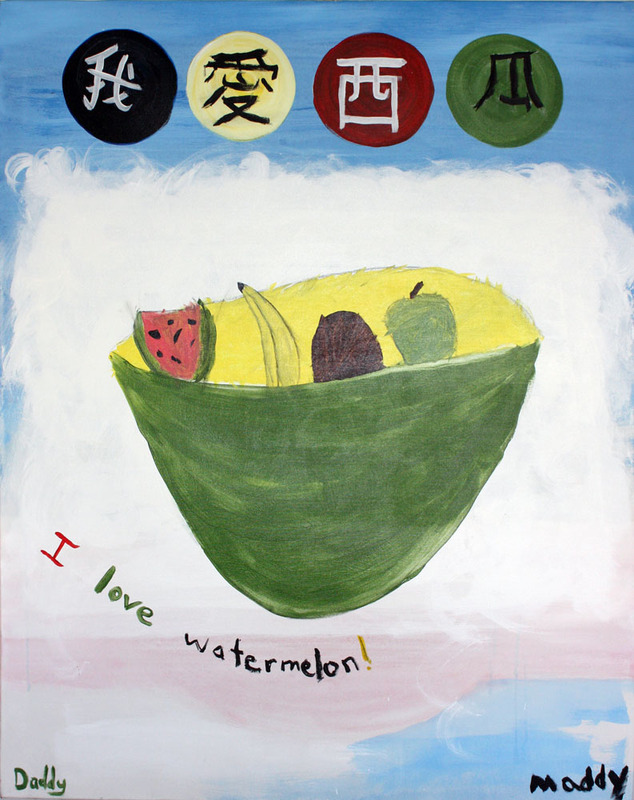 That’s how you say I love watermelon in mandarin”. I’ll spare you the proud dad moment, but that’s when we started collaborating in painting, and painting big. I didn’t want her to get stuck in small marks on small paper, thinking small. Think Big. Make Big. We collaborate. Generate lots of ideas together. Negotiate. Discuss. Consider. Negotiate. Plan and sketch, then paint. Maybe the collaboration is a bit slanted. I do some producaton work, and I have her lead with the ideas and content. It's about making a good team. I’ve been working in social arts and Arts Education and know that art ed teaches 21st Century Skills. Creative Problem solving. Collaboration. Communication. Critical Thinking. Id’ say that’s true from both a teacher and a dad’s perspective. If you’re working with youth, here’s a website I put together with the help of a grant from Crayola. “San - dwich- Cisco and the Golden Bacon Bridge” by Maddy Daddy. 40’ x 50” acrylic on Canvas. Go Big! Maddy Daddy Painting together.